One of the best Japanese brand for royal milk teas is Kirin (you might recognize their name for their beer but heir non alcoholic drinks are all pretty good too). 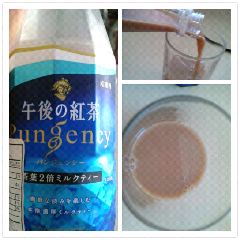 This 'pungency' one has a similar bottle and label to ones that we used to be able to bring into the states and the taste is also just as good as I remember. It has probably been about 1.5 to 2 years since I've had this! The red or black tea flavor has A rich and deep flavor. The cream and sugar are also in the right amounts. If you're in the u.s. and find it, you're extremely lucky! The closest I can get this is getting it in Canada since, for the most part, the us FDA banned this drink from imports due to the milk product. Man they need to chillax and let this stuff back in. Purchased at Yaohan center, (grocery store inside) located in Richmond, B.C.